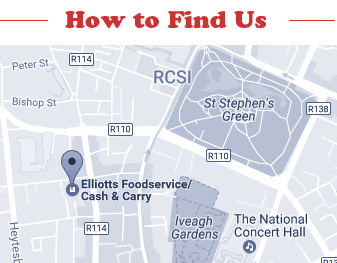 Elliott’s Foodservice/Cash&Carry is a family run and managed business established in 1961. Located in Dublin City Centre just 5 mins from St. Stephen Green on Camden Row just off Wexford St.
We are part of Stonehouse Group which is now Ireland’s leading independent wholesale company with a network of 24 member companies: all family run businesses totalling 30 warehouses nationwide offering both walk in and delivered service. Being part of this group gives us better buying power which in turn means we can pass these savings onto our customers. We cater for all business types including Restaurants, Cafes, Offices, Fast food outlets, Publicans, Hotels, Institutions, Health Boards, Clubs, Caterers plus many more. 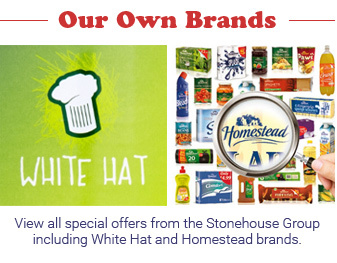 We have over 6,000 lines in stock and carry a full range of branded and own brand products Catering/Retail under the White Hat and Homestead labels. All of our product range is competitively priced and we also run monthly promotions across our range. Elliott’s provide an exceptional customer service striving to meet and exceed the expectations of all our customers and potential customers. We have a very experienced Sales Team and Telesales department which are on hand to help develop our customer’s business and focus on their needs. Elliott’s has been in existing for over 50 years and in recent years have made significant investments into rebranding, updating our deliver fleet, upgrading our cash & carry and also in our computer system making it easier for you the customer to access us.